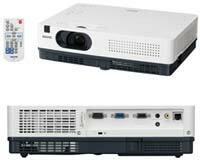 Sanyo has launched two new projectors for education, both ultraportable models. The PLC-XW250 and the PLC-XW200 offer network control capabilities and remote projection. The PLC-XW250 and the PLC-XW200 both feature an XGA-native resolution (1,024 x 768) and a contrast ratio of 500:1. The PLC-XW250 offers a brightness of 2,600 lumens. The PLC-XW200 offers a brightness of 2,200 lumens. The two models weigh in at 5.5 pounds and measure 13.1" x 3.4" x 9.7". The PLC-XW250 and the PLC-XW200 will be available this month. The PLC-XW250 will sell for $895. The PLC-XW200 will sell for $795. Further information can be found here.